You do not need to know how to draw to make a good portrait in fabric. You do not need to be an artist. The process of creating a fabric portrait requires no paint at all. The realistic effect is achieved strictly with fabric, repositionable fusible web and thread painting. With the step-by-step help provided in Portraits For Fabric Lovers you will learn how to select a workable photograph, use the computer to enhance the photograph, choose and apply fabric, bring the portrait to life with thread painting, and complete all of the final touches. 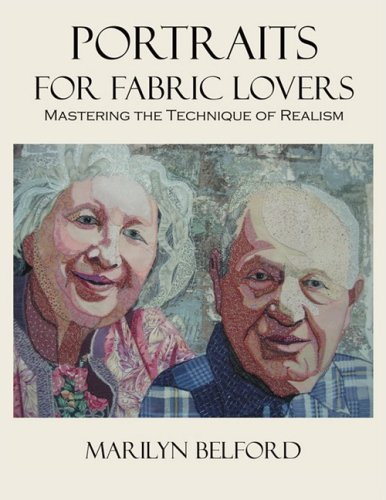 With this book you can successfully produce a fabric portrait that you will be proud to hang in your home. I have gotten so many compliments on my portrait quilt of my Mother. I’d like to thank you for teaching me to do this technique that I never thought I could do. You made it so fun and easy. Your RFP [Realistic Fabric Portraits] class at QU remains the best class I have ever taken. I loved it, and I thank you for teaching me how to do this amazing technique that I really wasn’t convinced I could do. I learned a great deal from Marilyn [. . .] While we can’t all be artists, we can all have a very artistic wall hanging in our own house that we accomplished with our own hands. I came across your website and think these are the most beautiful fabric creations I’ve ever seen. Thank you for your compliment. It is what every artist strives for. Where can I buy this book? I’d love to do this!! !